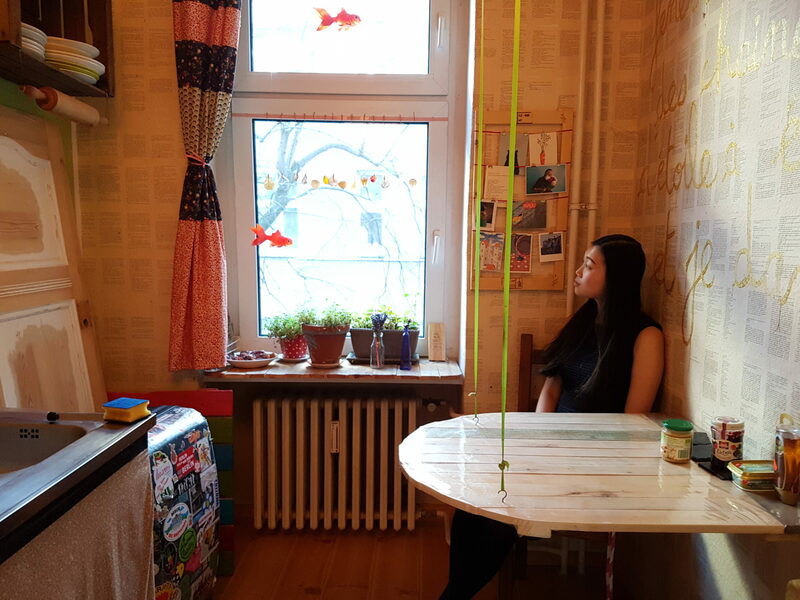 After arriving at Shuang’s sublet apartment in Neukölln, she settles into a poised position on the edge of a makeshift bed and tells us that Sonnenallee is one of her favourite places to live in Berlin. She’s lived in several neighbourhoods like Köpenick, Kleinmachnow (just over the border into Brandenburg), and Charlottenburg before settling in her current place in Neukölln. Last year, she also spent some time taking German courses and living in Düsseldorf. It was during her time there that we got in touch with Shuang through a Facebook post in the group Free Advice Berlin. 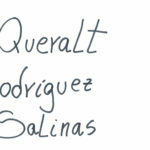 She had recently enrolled in a language course where the instructor struggled with pronouncing and remembering her name. It got to the point where the instructor asked her if she had an English name, which really bothered Shuang. Chinese, along with other eastern nationalities with ethnic names unfamiliar to their western counterparts, often choose an English name for themselves. Linguistic academics in Hong Kong point out in an article by The Atlantic that having an English name can elude to prestige in business practices or aspire more interest for Chinese learning English. 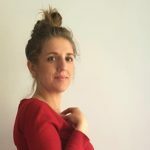 In addition, introducing yourself with an English name in formal settings can be more relaxed by adhering to cultural practices in countries like the US or the UK that quickly transition to a first-name basis. Moreover, if your ethnic name strays far away from the usual Johns, Peters, Dianas and Emmas, taking on an English name saves your foreign friends from struggling with the tonal nuances of your native language. Shuang is nonetheless bothered by this dismissal of her Chinese name and the demand that she present herself with an English name. She isn’t the only one. A group of Chinese in the US have taken a similar stance in adopting a foreign name. The Chinese, especially, have adopted English names perhaps because of globalisation. Some of the English names are not even considered names at all. They are just English words plucked out of a dictionary that seem nice and fitting. “I have a classmate, same age as me in China,” says Shuang. “She studies Mediterranean and she just gave her name like this: ‘Hello, I’m Mediterranean’.” She laughs as she tells us this, but also reassures us that it’s a common practice. Everyone seemed to remember the name Mia. It was easier for Shuang and easier for her new friends which made getting through her teenage years abroad more comfortable. It wasn’t until she moved to Berlin to pursue her talents as a violinist that a professor challenged her to embrace her Chinese name, especially as a performer. There might be some truth in what her professor said. After all, some of the best Chinese musicians in the classical music world go by their Chinese names like Lang Lang and Yuja Wang. Since then, Shuang insists that people call her by her real name. namennennen: So do you feel that your name Shuang now has a stronger meaning for you? Shuang: Yeah, I just want to tell everybody, even though it is difficult to read, this is part of me. I think this kind of lets a lot of people think about this question. Even I’m just one person who does this, I think more and more people will realize they should change this way of thinking. 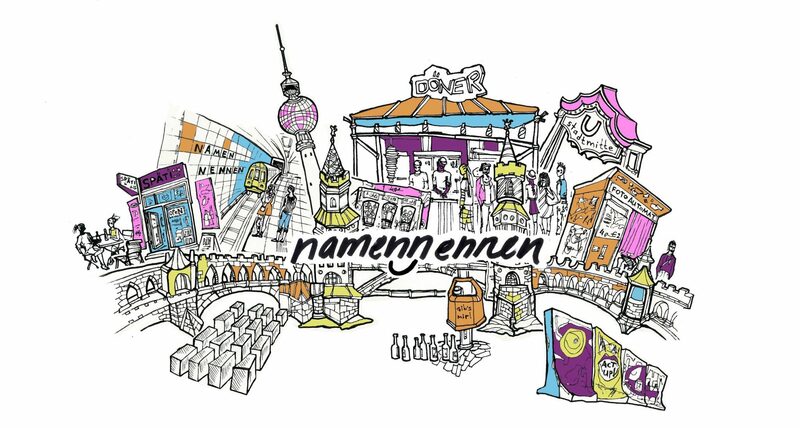 namennennen: With the experience you had in Düsseldorf, do you feel you are educating Germans about your name? Shuang: Yeah, actually, when I meet a new person, like a European or new friends of mine, I will do this and they are really curious about the Chinese. They will ask more and more and I think it’s good for the culture to let them know the Chinese culture and Chinese language. I think this is a good way for them to start to know about China. Shuang’s name was given to her by her grandmother and mother by looking up Chinese characters in the dictionary. Ironically, they wanted to give her a short and easy name so people would remember it when she studied abroad. 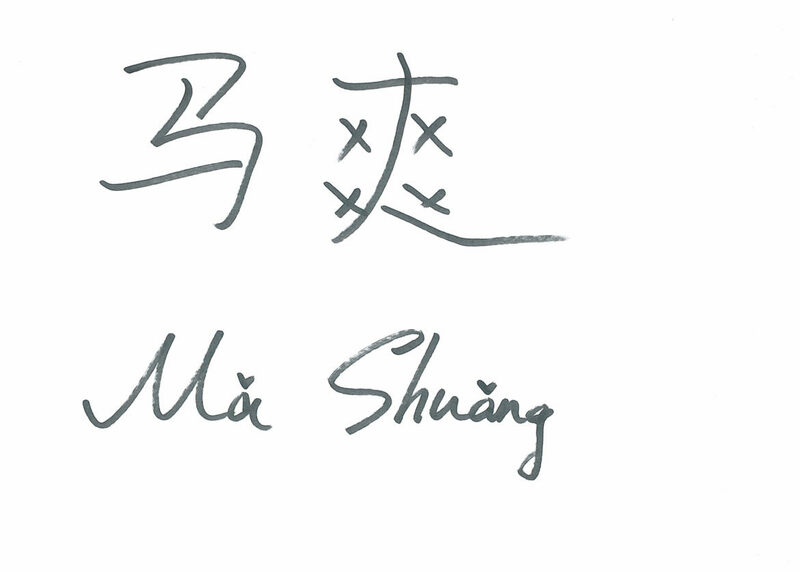 Shuang 爽 means comfortable or cooling and her family name Ma 马 means horse.